Last spring, Clemson became the only university in the country to provide all students, faculty and staff full use of the Adobe Creative Cloud. And this past fall, a new digital studio in the R.M. 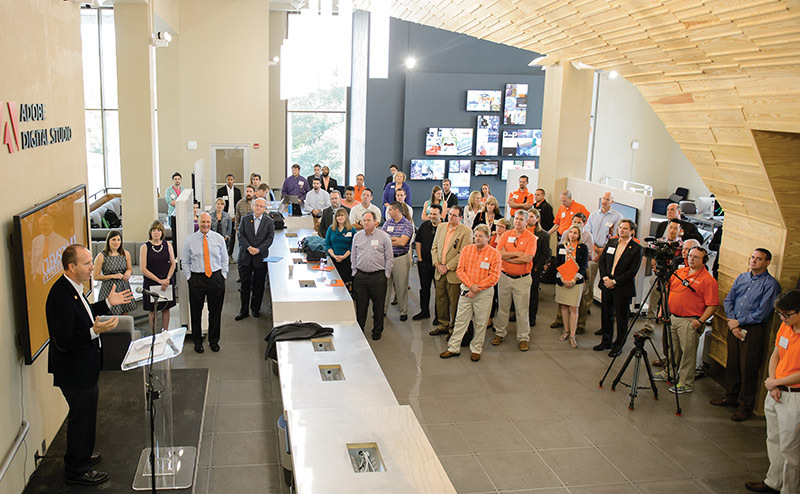 Cooper Library opened to give the Clemson community a place to work together, using technology powered by the entire Adobe Creative Cloud and Digital Publishing Solution, the industry-leading solution for creating engaging mobile apps. The studio features a soundproof audio production studio, a video production studio, collaborative workstations, a high-resolution scanner and a nine-display Behance wall that projects from Adobe’s Behance e-portfolio site based on search criterion. Clemson students also can upload their work to Behance so it will be displayed on the wall, something Holmevik said is appropriate for its library location. “Seeing your colleagues’ work portrayed in an artistic display is not only satisfying, but it helps spark creativity and make you want to do better,” he said.